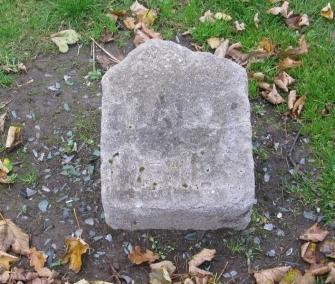 The small stones which traditionally mark the site of graves of Covenanters killed after the Battle of Bothwell Bridge are located in an area of grassland at Millgate Road. One of them may have had the date 1679 on it. Nearby are two large oak trees, which may mark the graves. After the Battle of Bothwell Bridge, hundreds of Covenanters tried to flee to safety. The pursuing soldiers caught up with many, and some were killed on sight. There are a few places in the Hamilton and Bothwell areas where they were traditionally buried. At one time there was another grave site near to Neillsland Road, Meikle Earnock, but this no longer exists. 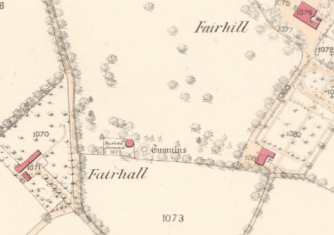 The Ordnance Survey map above (dating from around 1850) shows the Burial Ground and a 'Tumulus'. This is shown on later maps as a 'Mound' and is still visible on the site today. The Covenanters are thought to have beenburied below the mound.